Consumers are counting on the businesses in their communities to operate sustainably, but how can local businesses reach these goals? Realistically, most local businesses cannot achieve this goal alone. However, with the help from their city governments, small-to-medium sized businesses can succeed in meeting customers’ desire for eco-friendly products, services, and establishments. This is why Green Business Networks are useful programs for cities to offer, especially in a state like California where there are stringent emission-reduction targets to be reached within a certain time frame. 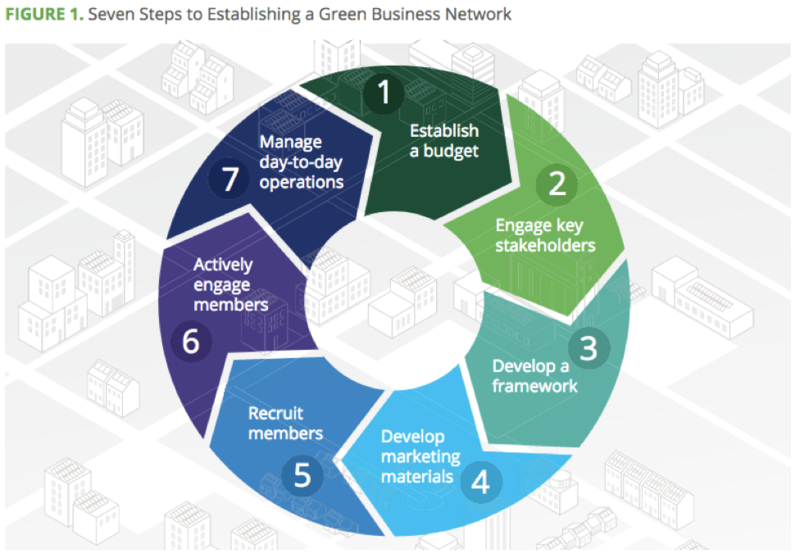 The San Diego Regional Energy Partnership, staffed by the Center for Sustainable Energy (CSE) has developed the San Diego Regional Green Business Network’s (SDRGBN) Green Business Network (GBN) Toolkit. 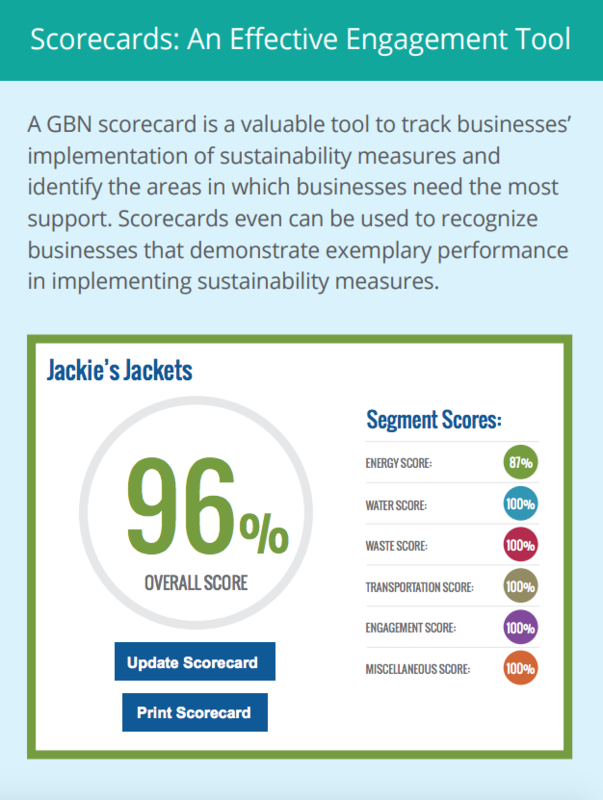 The following LGSEC Member Spotlight showcases the GBN Toolkit, which will help cities adopt Green Business Certification programs in the most efficient, sustainable way possible to aide their local businesses in achieving sustainability. Establish a Budget– Operation and implementation costs must be addressed in a realistic manner at the very beginning to ensure proper planning. The costs should be compared to the benefits via cost-benefit analysis, determined on an annual basis. It is important to scale the program to the amount of resources available identifying the external funding sources when establishing the budget is necessary. Overall, staffing needs, funding sources, network development costs for the first year, and operating costs should be the focus in this initial step. Engage Key Stakeholders– It is important to engage with business owners and employees early on to make sure the program has an established market in the area. Along with local business stakeholders, relationships with local utility, jurisdictional, and public agency stakeholders should be made to strengthen the GBN once running. After gaining this community feedback, the budget should be revisited and adjusted. Engagement with all stakeholders should be upheld through the development process so that these founding members can serve as a strong base for the launch of the GBN. Develop a Framework– The mission statement and goals of the program should be developed in this step. Goals and indicators should be SMART (Specific, Measurable, Achievable, Realistic, and Timely) and the mission statement needs to be clear. Existing local and state programs must be evaluated to align the goals and resources that will be offered by the GBN. Feedback from stakeholders in Step 2 plays a big role in determining what businesses are hoping to gain from their participation. Therefore, stakeholder expectations should be taken into consideration so the goals can be revised as necessary. The last task in this step is to create a logo and gain stakeholder approval on the design. Develop Marketing Materials– GBN staff should consider what marketing tools are achievable within the budget constraint. There needs to be an established, consistent form of communication such as a website, e-newsletter, and/or social media channels. Physical marketing options include brochures, banners, decals, or staff polo shirts for members. A Customer Relationship Management (CRM) system should be used to manage member contact information as well as creating a calendar of events viewable to members. Recruit Members– This step is reached once the GBN has launched. Members that are recruited should fill out an enrollment form identifying key information about the business. The staff needs to utilize the chosen CRM system to keep this data organized and to create a list of founding members. Founding members can serve as a contact to recruit new members; establishing a referral incentive is suggested for these cases. New members can also be added through formal recruitment campaigns and targeted outreach efforts. 7. Mange Day-to-Day Operations– To successfully manage the established GBN, an implementation plan that aligns with the marketing plan, engagement plan, and budget will outline the steps needed to be taken to achieve the mission statement and goals. The budget and goals should be continually revisited and adjusted to best reflect the progress and future of the program. Lastly, the entire 7 step process should be repeated periodically as the community and world evolves. The SDRGBN has 240 members to date and 11 partners. Partners work with the SDRGBN to host events to reach a larger audience, or to bring awareness and resources to smaller groups that can’t reach the opportunities on their own. Joining the program and attending the workshops are free, however homeowners are responsible for the cost of any carbon reduction strategies they choose to take. Most often these expenditures support the local economy and the sustainable products industry. Information about local rebate programs are provided for any participating member. The SDREP plans to use the Toolkit as a jumping off point for jurisdictions with few resources (time, money, staff) to research how to start a local network. They can learn from those who have already tested out planning and implementation strategies and apply them to their own, unique communities. CSE staffs the San Diego Regional Green Business Network (SDRGBN) as part of its partnership in the San Diego Regional Energy Partnership (SDREP). Established in 1996, CSE has a long-standing relationship in assisting local governments throughout California and beyond with sustainability program design, development, implementation, and policy.